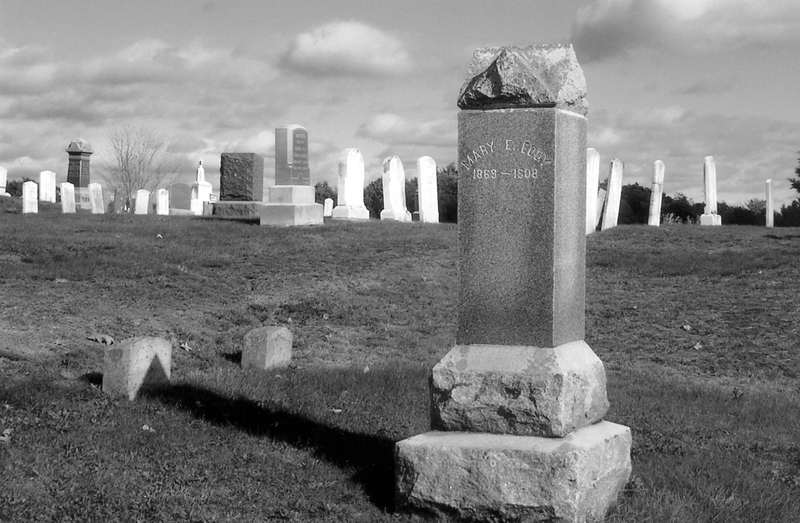 The grave of Mary Eddy rests on a quiet hillside in Glocester’s Acotes Cemetery. Her murder sparked what one newspaper termed, “a reign of terror” in Smithfield. It was described as a “brutal murder”, and a “horrific act of violence”, not that one would ever use gentle adjectives in such a case. After all, the skull of the young woman had been crushed; hit from behind by an unknown perpetrator using a blunt object; murdered for her measly paycheck of thirteen dollars; money she needed to help support her parents. The incident happened in Greenville, on January 3, 1908, and Smithfield’s Chief of Police, Jencks Smith, was faced with solving it. Forensic technology as we know it today did not exist in 1908. In those days, investigators had to rely on common sense, instinct, and a bit of luck. On the last day of her life, Mary Eddy arrived for work at 6 a.m. at her job at the Greenville Woolen Mill across from West Greenville Road. It was Friday; pay day. She had only been working at the mill for three weeks at a tedious job in the winding room, but she was used to hard work, having grown up on her parent’s farm in Glocester. She knew mill life too, having worked several years at a cotton mill in Centerdale before finding work as a maid. She liked domestic work better than mill work, but when her employer had to let her go, she came to Greenville and moved in with her sister on Mapleville Road. At the end of her twelve-hour workday, Mary stood in line to collect her pay of $13.13. For a sixty-hour work–week, this came to about 22 cents per hour. It was already dark when she set out for her sister’s house. She turned off Putnam Pike and started up Mapleville Road. (This portion of Mapleville Road no longer exists. As late as the 1980s, it ran between Putnam Pike and Austin Avenue, and was also referred to as “Pig Road”.) As she walked along the frozen ground, Mary likely felt a certain comfort in seeing the lights of her sister’s house come into view, and eagerly looked forward to her supper and warming before the fire. Of course, this is only speculation, for within sight of her sister’s house, someone came out of the darkness and struck her from behind. As she lay on the ground, her attacker rifled through her clothing until he found her money. Satisfied, he then left her for dead. It’s uncertain how long she lay there. A bloody trail indicated she tried to crawl home. When discovered, she was taken to her sister’s house where she died before morning. Chief Smith, notified of the crime, began his investigation. The murder weapon left at the scene was determined to be a dye stick from the mill where Mary worked. Word spread fast leading to wild speculation. Some said hobos or bandits were responsible, while others theorized it was someone from the mill. Someone remembered that Doctor Eddy, a relative of Mary’s, had been beaten and robbed several years earlier in almost the exact same spot. He too had been left for dead, but recovered. Could the two crimes be connected? In 1908, it was not unusual for small town police chiefs to request help in murder investigations from agencies that had experienced detectives in such matters. Therefore, Chief Smith wisely asked for assistance from the Providence police who sent Inspector John T. Haran. Inspector Haran discounted the theory that the assault on Dr. Eddy and Mary were connected, and also ruled out the possibility that a tramp or a hobo had committed the crime. He theorized that the killer knew the victim, and had lain in wait behind a stone wall knowing she would be passing that particular spot. After several false leads in the investigation, suspicion fell on a local 19 year-old mill hand named Earl Jacques, partly because he was said to have had “plenty of money” on the day following the murder, and partly because he reportedly borrowed a bottle of benzene from a neighbor to clean what were thought to be blood stains from his clothes. Earl was arrested at the mill on January 9. When Chief Smith and Inspector Haran got into the chief’s buggy with their prisoner, the carriage collapsed under their combined weight, much to everyone’s embarrassment. With their transportation out of commission, they were forced to walk the suspect down Putnam Pike to Chief Smith’s home on Smith Avenue. A growing crowed followed them the entire way. Once at the chief’s home, the officers locked the doors and wouldn’t let anyone inside. Under questioning, Earl denied any knowledge of the murder, claiming he was with a woman at the time. The woman in question supported his story, and even though investigators still had their doubts, they were forced to release Earl. The following night, a Georgiaville mill worker was severely beaten and robbed in the same manner as Miss Eddy. One newspaper dubbed it a “reign of terror” and mentioned that local residents were keeping firearms at the ready. Reports of other robberies in nearby towns began to appear in the press; a dozen in all, but there was nothing to indicate that they were all related. The attacks revived the passing hobo theory among the populace, but investigators weren’t convinced. Admittedly, the murder investigation was at a standstill, but Earl was still their prime suspect. Unfortunately, sometimes knowing something and proving it can be two different matters. All they could do was watch and wait, hoping Earl would slip up. Earl finally made his mistake when he gave a local girl a ten dollar bill to exchange for him at a Greenville store. For her trouble she received fifty-cents. The girl mentioned the incident to her father who in turn notified police. Earl was arrested again, but this time he was taken to the Providence police station. There he told investigators the whole story. In his statement, Earl related how the idea for the robbery came to him about four o’clock the day of the murder when he passed a pile of sticks used in the dye room. He hid one until quitting time. After running across some fields behind the mill, he hid behind a stone wall on Mapleville Road and waited for the first person to come along which happened to be Mary. After hitting her from behind with the stick, he proceeded to search her until he found the pay envelope, and then made his way home. He also confided to investigators that he had been about to confess when they had questioned him at Chief Smith’s home, when they suddenly let him go. Thinking he had gotten away with the crime, he later spent $4.13 of the money, and put three cents in the church collection basket! At the trial, there were some, including Earl’s mother, who said he wasn’t “right in the head”, and claimed he didn’t understand the gravity of the charges against him. Whether this was true or not, Earl’s arrest and subsequent confession brought to a close one of Smithfield’s most sensational murder cases. The attached file is a letter written by Earl Jacques in 1924 while he was still serving time in prison for the murder of Mary Eddy. It was submitted to the Historical Society of Smithfield by Smithfield resident Katie Law who found it on Ebay.